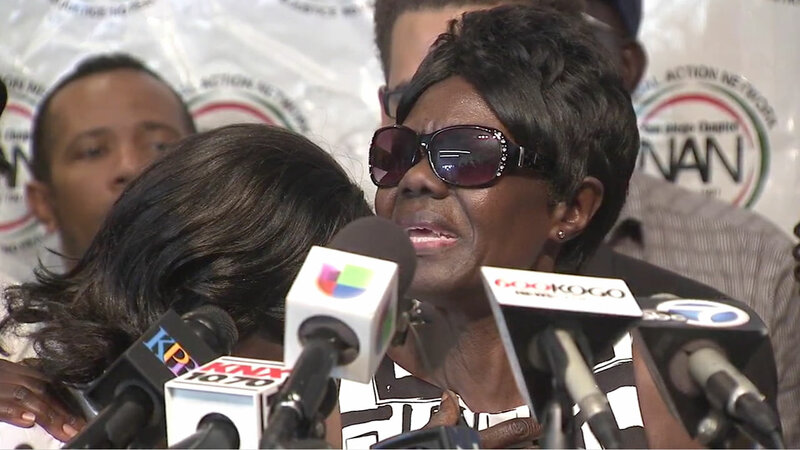 EL CAJON, Calif. -- The mother of Alfred Olango, an unarmed man who was fatally shot by police in El Cajon, spoke out Thursday, saying her son was not mentally ill but grieving for a dead friend. Olango's family, along with attorneys and activists, held a press conference and demanded the release of the witness cellphone video that shows the shooting. Olango, 38, was shot and killed Tuesday after police responded to calls of a man acting erratically and running into traffic. Initial reports indicated Olango may have been mentally ill, but his mother said that wasn't true. "He lost a best friend...people deal with death differently," Pamela Benge said. "He couldn't hold it the way I hold mine...he just got out of it so he was not mentally ill, never." The family had come to the U.S. from war-torn Uganda 25 years ago for protection. But Olango's mother said after what happened she isn't sure where to go since she no longer feels safe. "We wanted protection, but now I ask the question, 'Where should we go?'" she said. Several hours after the shooting, authorities released a photo from the video that shows Olango holding an object in a shooting stance and facing the officer that eventually shot him. The object was later identified as an e-cigarette. El Cajon police released this image of a man with his hands in a shooting stance right before officers shot and killed him on Tuesday, Sept. 27, 2016. Olango's sister had called 911 for help after she said her brother began acting strange. The family's attorney Rodney Diggs said police took an hour to respond and shot Olango within a minute of dealing with him. Rev. Shane Harris, president of civil rights organization National Action Network, said the photo police released doesn't explain the entire story. "We need you to release the tape because the tape shows the whole picture and not just a part of the picture," he said. But the San Diego County District Attorney's Office said the video would not be released because of the active investigation. The family will hold a rally and march on Saturday through the streets of El Cajon and invited the community to join them.